Ceramic packing provides excellent thermal and physical properties up to the maximum operating temperature of 1200 ° C.
It can be used as thermal insulation in a wide area. 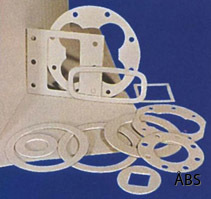 We punch gaskets ourselves at our own pace, which means we can keep short delivery times and really competitive prices. You can get punched what type of gasket you want according to drawing.